Nailhead trim is a great design detail that can be added to almost any upholstered furniture piece—sofas, chairs, ottomans, you name it. Some styles almost always look better with nailheads, like a Chesterfield sofa, while others shouldn’t go near it (they look out of place in super-modern spaces). But if you have a transitional home, it’s up to you whether you go nailhead or not. And that’s not the only decision you’ll have to make. Nailheads come in different sizes and finishes and can be applied in lots of different patterns. You could use brushed nickel or shiny brass to glam up a space or go with antiqued nails to add a rustic touch. Nailheads can add an exclamation point to furniture. Choose nailheads that are an opposite color from the fabric for more of a statement or to outline an interesting shape. Nickel on dark fabrics or dark bronze on light fabrics will outline the shape of the furniture and are more noticeable. But they don’t have to. Match the nailheads to the fabric for a subtle look. Nickel nailheads on light fabrics or dark bronze nailheads on dark fabrics will add a subtle design detail. Use your design style to help pick the nailhead. 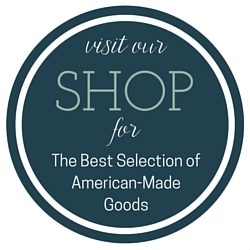 If you’ve looked through our different transitional styles, you can use them to guide your choices. If you like the Glamour Queen look, then bring in nickel or brass nailheads. Nailheads that are dark or matte go good in our Neutral Industry look. Modern Natural, Updated Vintage, and Fresh Traditional spaces are a natural fit for any finish of nailhead. It’s okay to only add nailheads to the bottom. You don’t have to apply nailheads to the entire sofa. If you want a taste of nailheads without having it all over, apply them only around the base of the piece as opposed to on the arms and back. Don’t add them to everything. 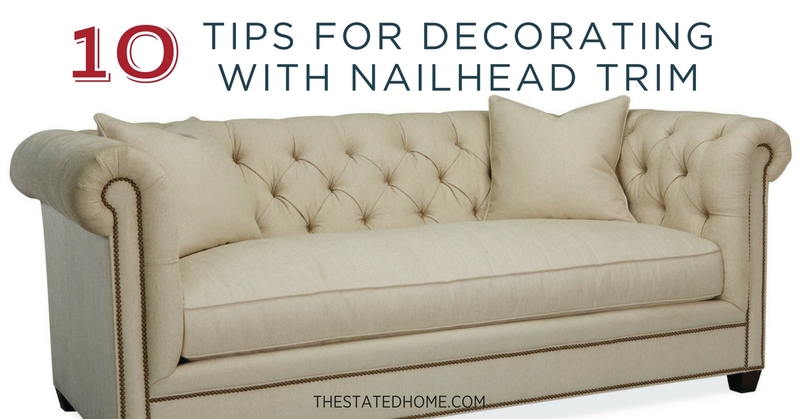 Don’t decide you love nailheads and add them to every piece of upholstered furniture in a room. Show a little restraint and add nailheads to a single sofa or chair (or pair of matching chairs). Use them to balance out modern elements. Transitional spaces are a mix of old and new styles, and nailheads can help bridge those two looks. If you have an upholstered piece that leans more modern (straight arms for example) nailheads can bring in a traditional element. Don’t get obsessed with matching metal finishes. The metal finish you choose for the nailheads doesn’t have to match the other metal finishes in the room. If you have brushed nickel hardware in the house, don’t feel like you have to do brushed nickel nailheads. As a matter of fact, bringing in a different metal finish can make a space look really interesting. You don’t have to worry about this going out of style. Nailheads have been used on furniture for hundreds of years and looks as great today as they did back then. Change the spacing to update the look. Traditionally, nailheads are applied right next to each other with no space in between. Get an updated look by spacing out the nailheads more. There’s another option if you aren’t sure about nailheads. Tack trim is made up of super tiny, flat nails that add a small detail to furniture without standing out too much. Think of them as a gateway nailhead. We purchased a chair with brass nailheads awhile ago. We are in the market for two couches and have found something we like. They have light fabric and silver nailheads, we are unsure what to do. Help……..! Thank you! Hi Sandie! I’m usually okay with mixing metals, but do prefer that furniture with nailheads in the same room have the same color nail. You may be able to find an upholsterer that can change out the chair nails to match the sofa. Or can you order the sofa without nailhead or with different nail color? With all of our sofas, we can choose nailhead finish or omit it and I’m sure other stores have the same capability. It may take longer to special order, but you’ll be happier in the long run!